See here for more information on our certificate programs. Learn how to give a professional full body Swedish massage. Learn how to give a professional full body Polarity massage. A hands-on approach to learning the structure and function of the human body. This class provides the skills needed to offer a complete general acupressure session and prepares students to work as an acupressure practitioner. You will learn a full body relaxing and healing Ayurvedic Massage. Students learn the foundations of Chinese Medicine including meridians, 5 elements and yin and yang. Students deepen their knowledge of paired organs, extraordinary vessels and Chi movement. In this class you will learn how to do visceral massage covering all the internal organs as well as Buddha Palm technique. 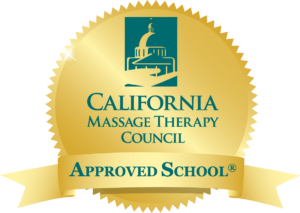 Meet California standards of practice management. Learn techniques to promote health, vitality and resistance to disease. Students will learn the system of Reiki and how to give a full body Reiki Treatment. Learn a complete, professional Shiatsu treatment for the whole body. Students will learn Thai massage techniques for front, back and sides of the body. Read about new faculty member Jason Kal’s upcoming course here!